It’s time to reveal the best choc free Easter treats for the big kids in your family, guaranteed sticky finger free. These gifts are a great way to share Easter with family overseas as even with all the best intentions, chocolate eggs aren’t the most mail friendly Easter pressies! 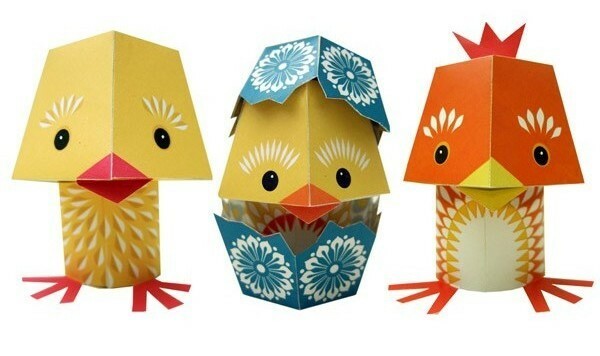 Eggory Peck, Sophia Le Hen and Cluck Gable are sure to bring a bit of Easter cheer to your holiday weekend. Let the kids get crafty with this super sweet set of DIY decorations by British design company Mibo. 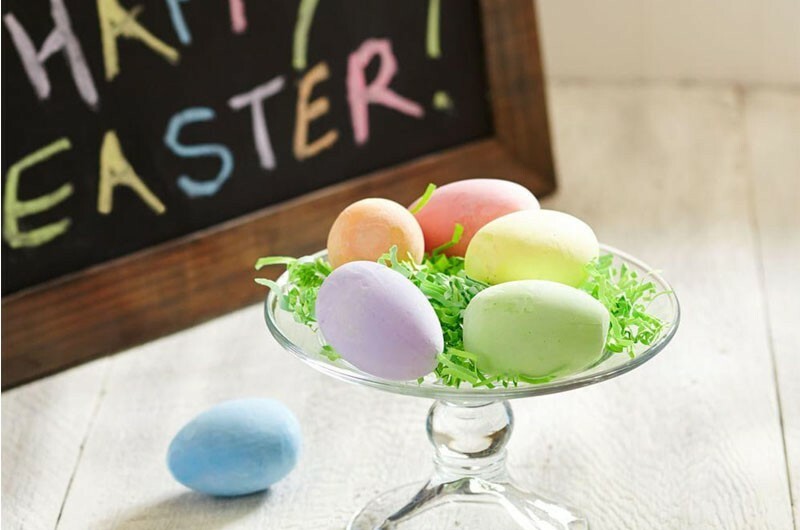 Just gather some glue, a ruler and a pair of scissors and get folding and sticking for a great Easter themed activity. Each chicken takes about ten minutes to make for ages six and up. Available for $12.50 plus $8.95 delivery fee from Send a Toy. So that’s where the Easter Bunny hides out when he finished hiding all those eggs! 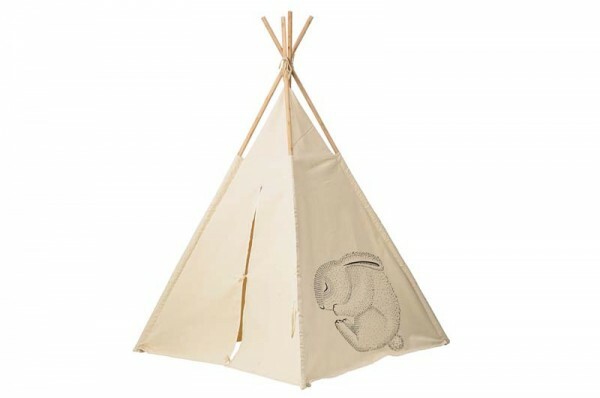 This adorable mini children’s teepee tent from Bloomingville Mini stands 160cm high and features a cute sleeping rabbit. It makes a perfect nook for storing soft toys and Easter booty. Available from Leo and Bella for $295 plus shipping. Maybe eggs aren’t entirely off your Easter menu. 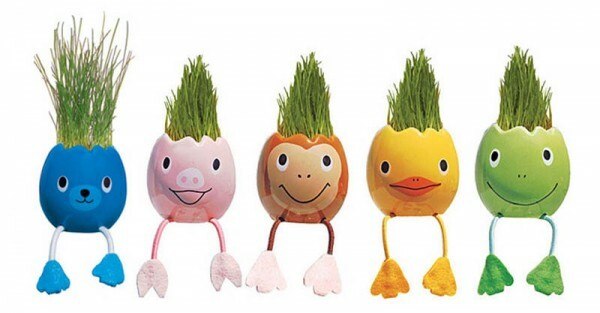 Invite these cheerful little guys to the party and get the kids to style the growing grass hair of these cute Nyokki ceramic eggs, then cut it and watch it grow again! Filled with rye grass seed, Nyokki are easy to grow – seeds germinate and grass grows to full height in less than two weeks. Available from Wrapables for $19.95 plus shipping. After a hard weekend’s treasure hunting, what better than to snuggle up in the cutest PJs in town. Snugglebum make soft as a bunny’s fur 100 per cent cotton pyjamas for kids right up to sixteen years, including these just-for-Easter delights. Find a huge range of designs for boys and girls at Snugglebum. 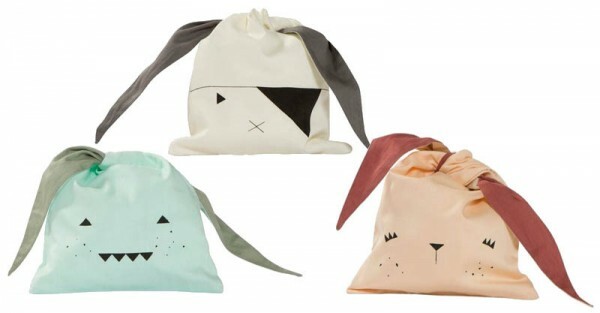 For the ultimate in Easter fashion you can’t go past these utterly adorable Bunny Bags by Danish design crew Fabelab. The perfect Easter swag bag or to carry snacks at any time of year, just tie the bunny ears together tight or loose to make a bag that’s fits over shoulder or in the hand. Plus they’ll last long after Easter as a great room decoration too. Available in 3 colours: Dreamer (peach / rosewood), Adventurer (mint / green) and Pirate (light grey / dark grey). The bunny bags are available from Wiggles Piggles for $24 plus $7.50 shipping. Pavement chalks never go out of fashion and would be a great way to get the kids involved in making an outdoor treasure hunt. This set from Pottery Barn includes six chalks of different colours for $15, plus you can even get them gift wrapped for an extra $6.95 so they arrive perfectly packaged for eager little fingers. 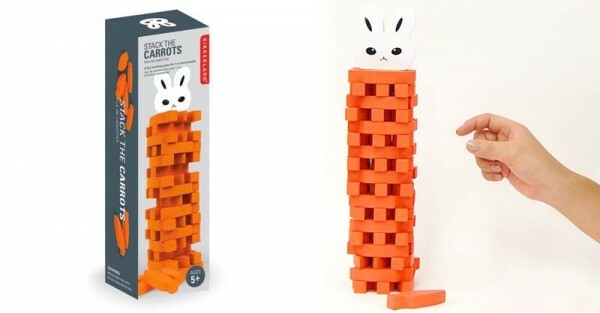 A cute twist on the Jenga style block stacking game, Stack the Carrots is sure to bring a few laughs to your Easter weekend. A great game for the whole family, get everyone in on the block stacking action once it’s time for a little rest and relaxation together. Blocks are crafted from eco-friendly Paulownia wood. Available from Amazon for US$19.99 plus shipping. 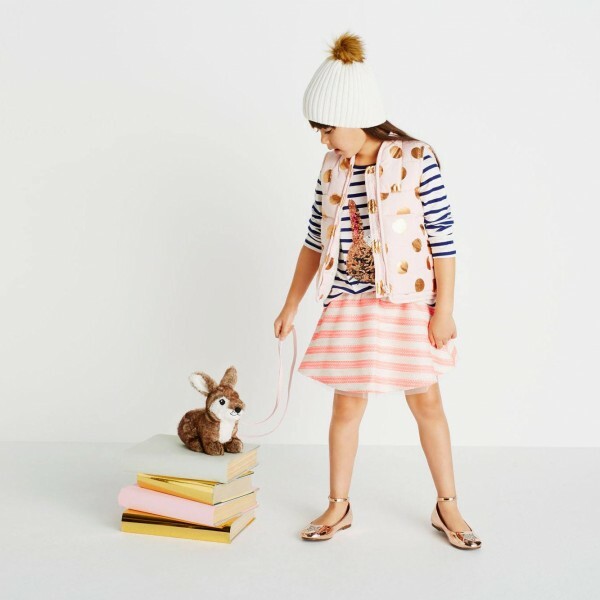 If it’s Easter-themed clothes you want, hop on into Seed for a gorgeous collection of wardrobe options and bunnies galore. Girls can have a flashy Easter with sequins and glitter at Seed (above) or be a bit more demure over at e3-M with this delightful bunny tunic-style top (below) in jersey and voile. 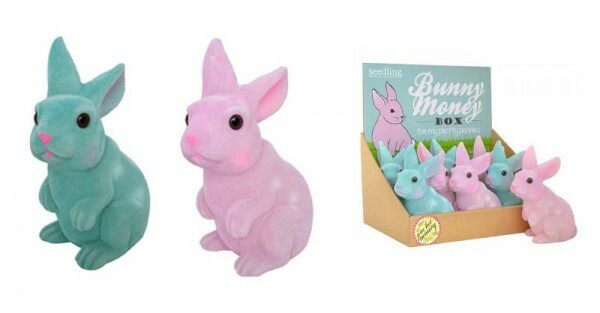 This Bunny Money Box from Seedling encourages kids to save a little something for a rainy day. Available in pink or blue, these plastic money boxes have a flocked fur finish, cute pink noses and a coin slot in their backs. An Easter bargain at only $9.95 plus shipping from Lime Tree Kids. 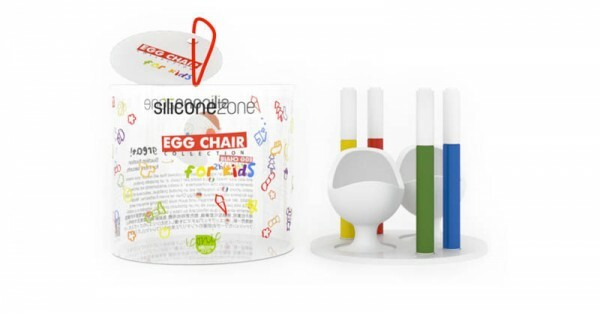 Kids can make sure their breakfast eggs are sitting pretty this Easter with this cute Egg Chair craft set. Use the red, yellow, green and blue markers included to create your own unique designs. The marker simply washes off with soap and water so can be used to decorate time and time again. With a strong suction base you can be sure those eggs won’t be taking a topple either. Currently on sale at Cool Things for $19.95 plus free shipping world wide! These note sets make a wonderful prize to find on a treasure hunt, perhaps there might even be a note from the Easter Bunny inside! The kids will love writing a secret letter to a friend or decorating an envelope or diary with the lovely sticker labels. 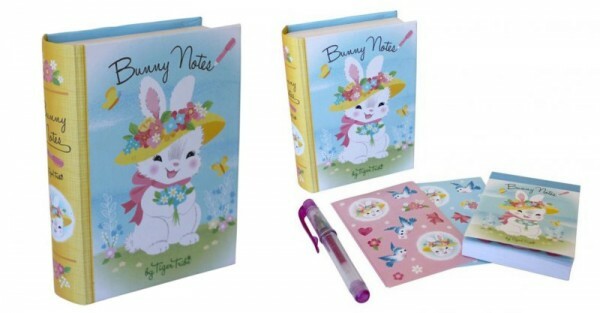 Beautifully illustrated by Tiger Tribe, each Bunny Notes book contains a notepad, thirty stickers and a glitter gel pen. Available from Little Boo-Teek for $14.95 plus shipping. Finally, here’s one for the kids who eschew all things cute at Easter. 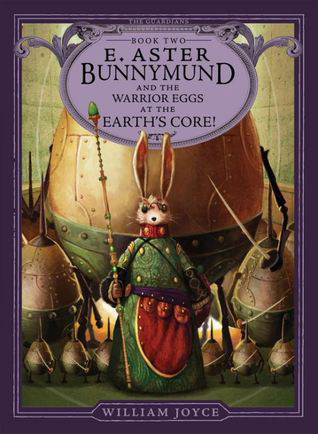 It’s William Joyce’s rollicking tale of the Easter Bunny – or E. Aster Bunnymund – martial art extraordinaire and defender of the world’s children from the Nightmare King. A fabulous read, your kids won’t be able to put it down. Find it at Book Depository. 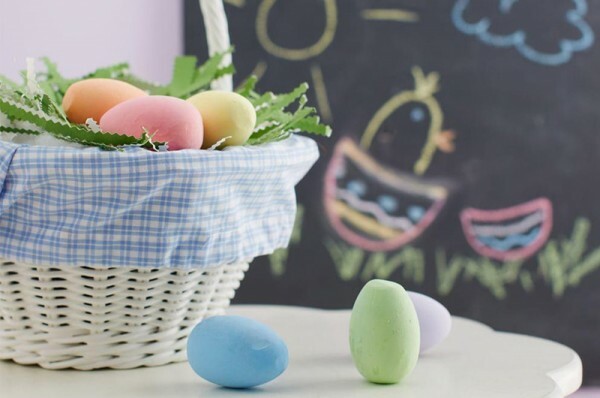 Make sure to check our other Easter guides to find ideas for babies, toddlers and little kids.